It’s very easy to believe that lots more clients is exactly what you need. Lots more clients means lots more income. Lots more clients means you can pay your staff and suppliers. Lots more clients means you can take on an extra pair of hands. Lots more clients means you can pay yourself properly or take a dividend. Lots more clients means you can grow. Lots more clients means you can stop worrying. Apart from the small matter that more clients makes for a larger company which is harder to manage, I’m going to explore the basic assumption that having lots more clients is what you should be aiming for, from a new business perspective. In comparison, that is, to whether having just a few more of the right clients is a better goal. One obvious thought you may be having is that perhaps our goal should be LOTS more of the RIGHT new clients. OK. I get that. And if it was that easy to attract the right clients, then fine. But it’s not. So – as an SME – start small. Get the hang of attracting the right ones, and then scale that up. Don’t go for volume first, with the hope of filtering out the wrong’uns later. That is much harder than you think. (You’ll see why at the end). How do I know who the right, new clients are? This is the fun stage. 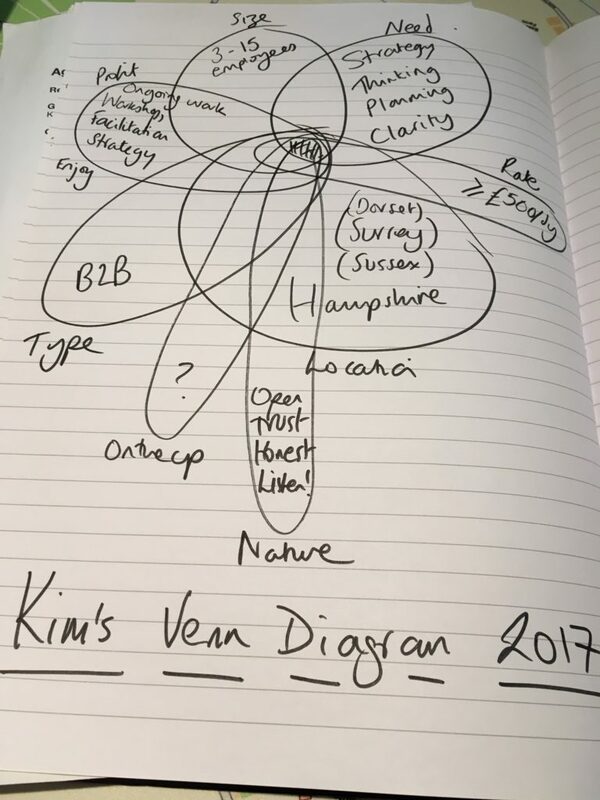 You are going to draw circles, loops, boxes – or whichever sort of shape your brain likes to work with – which will illustrate the different features of your right, new clients. What type of work do those clients want from you? Which sector(s) are they in? What size or structure are they? How many employees – or what size turnover? What type of work is most profitable for you? How much could/did you charge? (Remember, best client and projects in mind). What type of work do you enjoy most – or… what makes you feel that you are plugging the biggest gap for your client? That’s a big old Venn diagram. But it doesn’t have to be a fancy one. Here’s a photo of mine. (Illustration was never my strong point – but I am quick). It hopefully shows you that you don’t need all the answers yet, but it’s still worth quickly jotting this stuff down to get things clearer in your own mind. It’s not really what your Venn diagram looks like at the end that matters. It’s the fact you’ve gone through the process of asking yourself these questions. You will be working out some important things. What do my right, new clients look like? So you’ve defined those right, new clients. Now what? I still haven’t tackled my original point. Why would just a few of the right clients be better than getting lots of general clients? Hopefully, some of my questions above will have started this thought process. If not, a word on general (or non-ideal, by which I mean not really right for you) clients. If any of the statements below strike a chord with you, then you’ll see what I mean very quickly. How many of the clients below do you want? Go out to market for competitive quotes from suppliers they’ve never worked with in order to negotiate or get you to price-match. Nearly every time. These are what I think of as general clients. There are plenty of them out there. But these are the dangerous ones. Not through any fault of their own – but they are dangerous because they are the ones you will get more of most easily. Unless, that is, you focus on attracting the right ones. And – here’s the crunch. Because of all the features of those general clients (the low-margin, poor paying, long distance, price sensitive etc. ), you can get more and more and MORE and EVEN MORE of these clients, and never actually improve your business, or earn any more. Oh, your turnover may increase. In fact, it almost certainly will. But what about your profit? Your sanity? Your love of what you do? Your ability to recruit, or give your team a bonus? Arghjghjg ! Fat chance of any of that. You’ll be far too busy servicing all those exhausting clients just to keep yourself standing still and out of the VAT man’s little black book. So – the moral of this story is simple. Go and get yourself some lovely new clients – just a few of them. Leave all the rest for someone else. Could you please do something for me? I write posts like these so that people don’t make the same mistakes that I made earlier in my career when I was responsible for bringing in the new business in a marketing agency. I also write them so that people can see (or rather hear) the way that I think, and the way that I work. If they like the sound of that, they can hire me. So if you’ve found this article useful in some way – please share it with others. I recommend using the LinkedIn button at the side. Muchas graçias. (No, I can’t speak Spanish, but I often wished I could). Would you like more articles delivered to your inbox? Am I the right person to help? You might not be sure whether I’m the right person to work with you. Call me now on 07827 297569 for an open, ten minute conversation and you’ll be more sure, either way. Our fit is the most important thing.